Did Makeup Artist Kevin Aucoin Use The Same Mascara On New HSN Vendor Martha Stewart and Her Male Craft Expert For One Of His Makeover Books? Martha Stewart’s “craft guru” Alex Perruzzi, who appeared on her HSN debut Monday, is a nice looking guy. But he was gorgeous as model Linda Evangelista. Perruzzi was extremely close to Kevin Aucoin, who made the lad up to look exactly like the famous supermodel for one of the makeup magician’s books. Not that there’s anything wrong with that, seriously. It’s just funny to see this young man paired with prim and proper — at least in public, and discounting her jail time — Stewart. And who would expect someone from the trendy, high-fashion world of Aucoin to be demonstrating for home shopping viewers how to make paper decorations? Aucoin, who passed away in 2002, transformed Perruzzi to look exactly like Evangelista in his book “Face Forward.” Perruzzi is a dead ringer for Linda in the book. We wish we looked that good (we happen to know that Evangelista is a fellow Taurus, by the way). 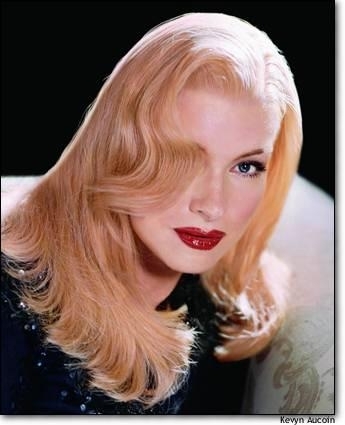 In that same book, Aucoin made up Stewart to look like Veronica Lake. Martha looks stunning, unrecognizable, a real glamour puss. We don’t know if Stewart met Perruzzi when they were posing for Aucoin. Here is a story about Aucoin’s books, which talks about Perruzzi as Evangelista. And here’s an item about Stewart’s turn on as Veronica. We expect that Perruzzi will be the one who spends most of his time flying down to St. Petersburg to appear on HSN in the future, not Stewart. She has a lot on her plate, including a new programming deal with Hallmark Channel.